Graduate Elisabeth University of Music in Japan, Westfalen University of Church Music in Germany and the University of Music and Performing Arts in Vienna, Austria. She debut in Europe in 1982 as a professional concert performer. She has a career of woildwide performance activity, such as in Germany, Austria, Sweden, Norway, Finland, Holland, England, Poland, Hungary, U.S.A., Canada and Japan. Her performances in "Organ Week Festival" and "International Music Festival" in Salzburg and Finland with orchestra on T.V. and radio gained an enthusiastic reviews from critiques. Especially, "Pray" (composed by Kazuhiro Onoe that is dadicated for peopel who died by atomic bomb during WWⅡ) had performed by her first time in Hiroshima Peace Memorial Concert, won high recognitoin from Europe and America. While performing actively woldwide, she has released several CDs including, "Kaoru Hiyama Pipe Organ Recital Toccata" (1991), "Christmas DOD's LOVE" (2002), and "The Passion, the Cross and the Resurrection of Jesus Christ SALVATION" (2004). She was chosen as an organ player for "Music Festival in Berlin " (1992) that was sponcered by representatives of former East and West Berlin Chirstian churches as comemmoration of the unity of East and West Germany. In 1993, she was invited as an instructor by the Altenburger International Music Seminar and gave recitals in Austria, Germany and Holland. She also is involving a charity concert for children in Sarajevo and received an high recognitions from critics. She has had anual concert tour at Europian countires sice 1982, including, Hungary (Budapest), Austria (Viene), Gemany (the Martin Lutehr's church in Wittenburg), and England. 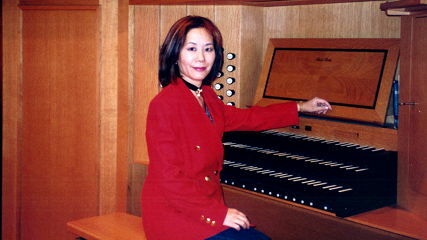 She is a member of the Association of Japanese Organist and a member of Society for the Study of Organ in Japan. Cuurently, Kaoru is the church music director and organist for the Hiroshima Church of Christ and the director of the Kaoru Hiyama Music Academy in Hiroshima. Born in Hiroshima, Japan in 1954, Kaoru Hiyama started learning the piano at the age of 6 and the pipe organ at 17. She received a scholarship to study at the Elisabeth University of Music (Hiroshima), and continued her studies at the School of Church Music in Westfalen Herford, West Germany from 1980 to 1982, under Professor Arno Schonstedt. From 1983, she studied at the University of Music and Performing Arts in Vienna under Dr. Rudolf Scholz, and received a diploma in December, 1984.. She studied the harpsichord also.She gave concerts including the Opening Concert for the International Organ Week in Dusseldorf (Germany), Eisenstadt (Austria), Kamien Pomorski (Polland) in 1999. She gave eight concerts in Germany and Austria, as the Official concert for the International Exposition in Hannover in 2000. In summer of 2002, she made concerts in the Dom in Salzburg, in St.Marien Church in Lubeck, in the Markus Church in Hannover and in the Dom in Schleswig. She has made some concert tours with her handbell team which she directs and she performs herself in, since 2000. The names of the concerts are Joyful noise in Germany in 2000, Handbell Quartet Mai, which means dance, in Norway in 2001, and Handbell Duo Takumi in Austria and Germany in 2003 and 2004. She performed with European and Japanese orchestras and released a CD, played on radio and T.V. broadcasts. She also lectured at church music seminars in Japan and Altenburger Music Academy in Austria. She is the director of Kaoru Hiyama Music Academy and supervises at church music groups in Hiroshima.